The solid line (1) indicates a zone within 1 ft (30 centimeters) of the rear bumper. The dashed line (2) indicates the clear zone of approximately 5 feet (1.5 m) behind the bumper. These lines also indicate the outmost limits that any object (door mirrors, corners of the body, etc.) extends out from the vehicle , even when the it turns. 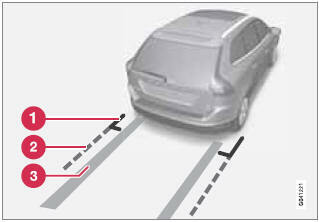 The "wheel tracks" (3) between the side marker lines show where the wheels will roll and can extend up to approximately 10.5 ft (3.2 m) behind the bumper if there are no objects in the way.